Radionics Stations -Mobius Coils - EM Pollution Control - DIY Plans & More! This is free information, but it costs money to produce. If you want to support the ongoing R & D taking place at Wizzers Workshop, you can make a donation in the amount of your choosing through paypal with the button next to this text. You are free to access this information with or without making a voluntary donation. Donations go to cover the costs of Bioenergy Research and development / Publication / release of information concerning Orgone Matrix Material / Bioenergy Sciences. Thanks, and don't forget to check out our free ebooks. The type of orgone device which is commonly called a 'Holy hand grenade' is a medium-sized device which attracts harmful Orgone energy, converts it to healthy Orgone energy, and emits it again as a flow of healthy orgone energy. This is different from other orgone devices used up until this point, which had the ability to block or collect harmful energy, but not convert it to healthy energy. The device gets it's name from an old Monty Python movie ;)... It was invented ( by Don Croft ) to counteract the adverse physical and mental health effects of HAARP, GWEN, ELF, SCALAR and HPRF transmission towers. The HHG device is a highly effective multipurpose energy cleaner. Think of it as air freshener for your aura. When placed in an area, buried, or placed in a body of water, the Orgonite Holy hand grenade will act to continuously clean the Orgone energy within a surprisingly large radius (average 3/4 mile radius from the device). Although many of us who build these devices are familiar with using various minerals in metaphysics, and therefore use synergistic combinations of minerals to enhance these devices, the basic components of an HHG are quartz crystals, metal particles and organic resin. After about six months, they benefit from being moved around a bit if accessible. Note: While there are many other suitable vessels which could serve as mold for this device, I have used a plastic funnel for this example as it is readily available in most places and relatively durable. In any case, the same technique of construction applies regardless of the container used for a mold, which can be in the shape of a pyramid, cone, cylinder or hemisphere, so long as it has a volume at least great that of a as a cone 4" wide x 4" tall. 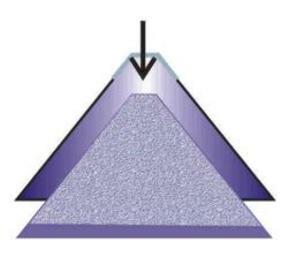 Presently, pyramids and cones are the shape this device is most often built in. 1. 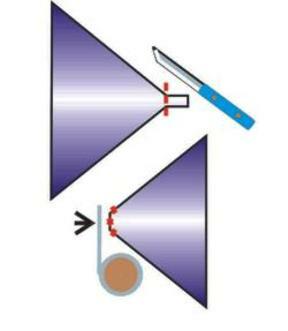 - Cut the tip off of the funnel and tape over the hole at the small end of the funnel with aluminum tape (preferable) or parcel tape. Electrical tape, duct tape & masking tape do not work as well for this as aluminum tape. In some way, plug the hole so that the resin does not leak out. 2. - Sit the funnel in the jar so that it is upright and more or less level. 3. 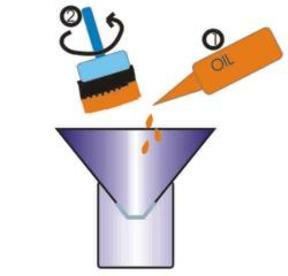 - Coat the inside of the funnel with a thin layer of vegetable oil, to keep the resin from sticking to the mold (funnel). Wipe away the excess oil with a brush or clean cloth. 4. - Put about 1" of metal particles in the bottom of the mold. 5. 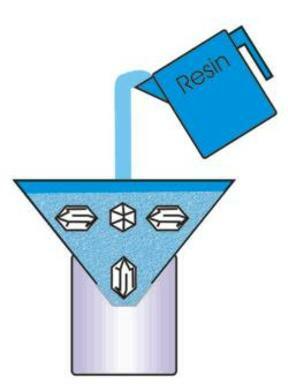 - Place one of the Quartz crystals in the tip of the mold, so that it is upright as shown. This one really should be a double terminate, but if you only have a single terminate, put it with the point towards the tip of the funnel. 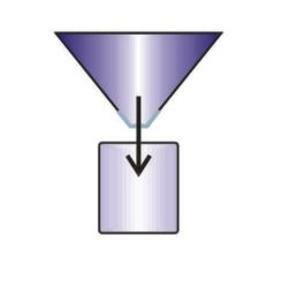 If it is a double terminate, the best tip of the crystal should be pointing towards the tip of the funnel, where you covered the hole with tape. 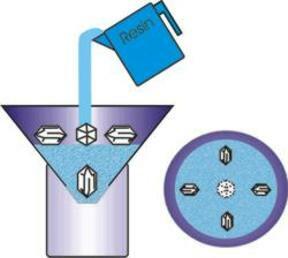 Mix enough resin and catalyst (be sure to mix well, min. 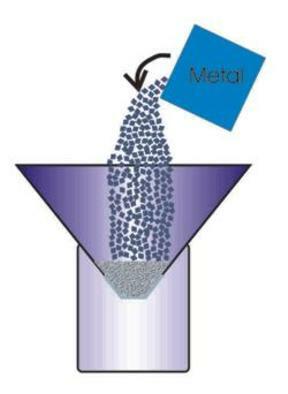 1 minute of mixing) to come up level with the surface of the metal filings. Pour the resin in and let it run down into the metal filings. Gently shake or tap the mold to release bubbles. 6. - Put in some more metal particles, enough to fill the mold about 1/2 to 2/3 full. 7. 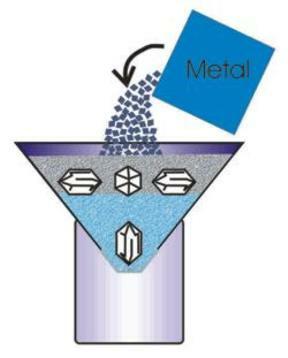 - Place the other 4 Quartz crystals on top of the metal filings as shown. They should be arranged like the spokes of a wheel. 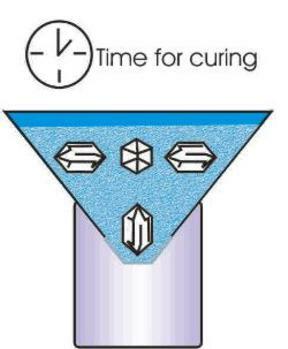 The better points of the crystals should be pointing towards the outside of the mold. If you have to, you can use single terminate crystals here, and put them with the points either facing in or out (facing out is preferable). Mix some more resin and catalyst, and pour in enough to come up level with the surface of the metal filings again. Gently tap or shake the mold to release bubbles, and let the resin run down into the metal filings. 8. 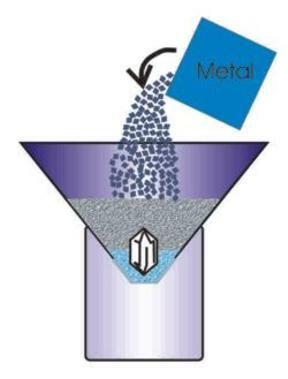 - Add some more metal filings, enough to almost (but not quite) fill the mold. Leave about 1/4 inch of empty space at the top of the mold as shown. 9. - Now, pour in enough resin to finish filling the mold. Let the resin run down into the metal filings, adding a little at a time. 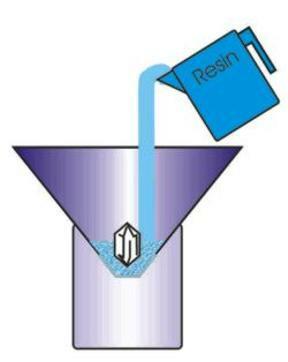 Use enough resin to completely cover the metal filings, so that there is a thin layer at the top of the mold which is only resin, no metal. The layer of resin only should be about 1/4" thick. Take a moment to adjust the molds so that they are more or less level at this point. 10. - Allow the resin to cure. Keep it warm if possible, cure in a well-ventilated area, and if possible, expose the resin to sunlight while it is curing. If you have a tone generator or other sonotherapy (healing using sound) device, then you can expose the resin to that as well while it cures. 11. - Remove the molds from the jars, turn them upside down, and give them a smack to release the brand new HHG you just made. If the mold sticks, you can either use a thin bladed knife to push in between the mold and the resin, or you can try spraying penetrating oil around the edges where the mold meets the resin. Dropping it on the floor sometimes works, but sometimes it breaks the resin. 12. - There are many ways to modify an HHG for enhanced effects, but the basic model shown above will work just fine the way it is. This is one modification which is easy to perform when you are casting the Hhgs. Use an Amethyst point instead of a DT Quartz crystal for the vertical crystal... add a copper SBB coil to the base of the unit, just at the edge of the metal filings as shown... add a small piece of hematite, pyrite, or a small permanent magnet to the SBB coil as shown (generally I put the N pole of the magnet facing toward the tip of the HHG)... and mix some crushed quartz, crushed Amethyst, or crushed Pyrite in with the metal particles before you cast it. This is all the info you need to get started making fully functional basic HHGs. Please feel free to make copies of, re-post on your own site, save on your hard drive, print and/or distribute this page freely, so long as the page is reproduced in it's entirety and unaltered, including all links embedded therein. There is a runic version of the orgonite above which provides for the idea and action of it here. Orgonite TM is a trademark belonging to Karl Welz, the inventor of orgonite, and is used on littlemountainsmudge.com for educational purposes. Wizzer's Workshop TM, Ergonite TM, Welzite TM, Wood Sprite TM, Water Baby TM, Chocolate Shine TM and O-Matrix Material TM are trademarks of Jon Logan, Owner of littlemountainsmudge.com. All text and images on this site on this site, unless clearly otherwise stated, are copyright 2003-2006 Jon Logan, all rights reserved. Limited authorization to reproduce: This material may be reproduced or reprinted freely, in whole or in part, for educational purposes. Owner of copyright for text and images on littlemountainsmudge.com and trademarks used on littlemountainsmudge.com reserves the right to refuse, suspend or revoke limited authorization to reproduce this material if the material is reproduced inaccurately, or if printed material from this website is sold at a cost in excess of it's production without prior written consent from the owner, or if printed material from this site is used commercially without stating in the printed copy that the material is copyright 2003-2006 Jon Logan. Webmasters using material from this site must include " courtesy Wizzers Workshop http://www.littlemountainsmudge.com" at the end of the portion of content which is reproduced on your website.